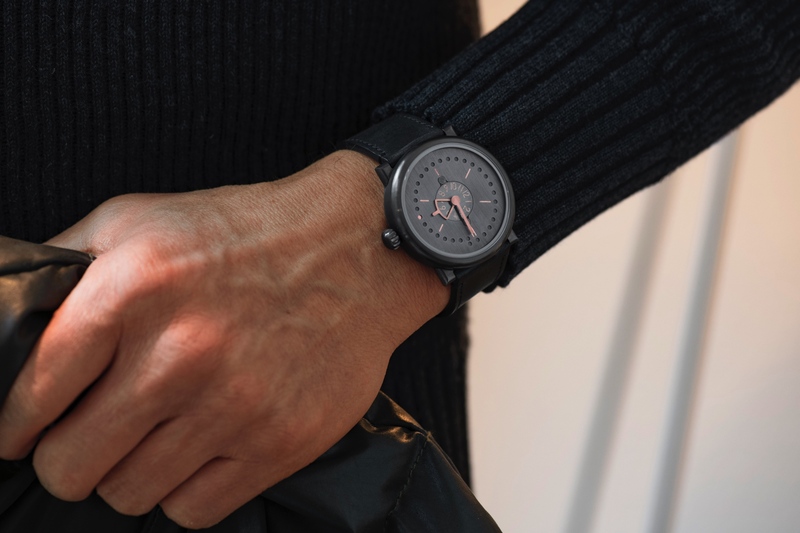 The Anno Cinquanta is an annual calendar from new watch brand Ochs und Junior. The annual calendar complication uses circular apertures (dots) to display the month, day and date (month – at 12 o’clock, day – at 6 o’clock and date – at the perimeter of the dial). Ochs und Junior watch cases are so precisely machined (lathed and milled) that no final polishing is required. Every little mark the case receives will reveal something of the life its owner has led. Paul Gerber is personally responsible for hand-chamfering the edges of the strap lugs. The name of the watch derives from the annual calendar’s 50 apertures (“Cinquanta” means fifty), which Oechslin personally drills into the 0.3 mm thick white gold dial. 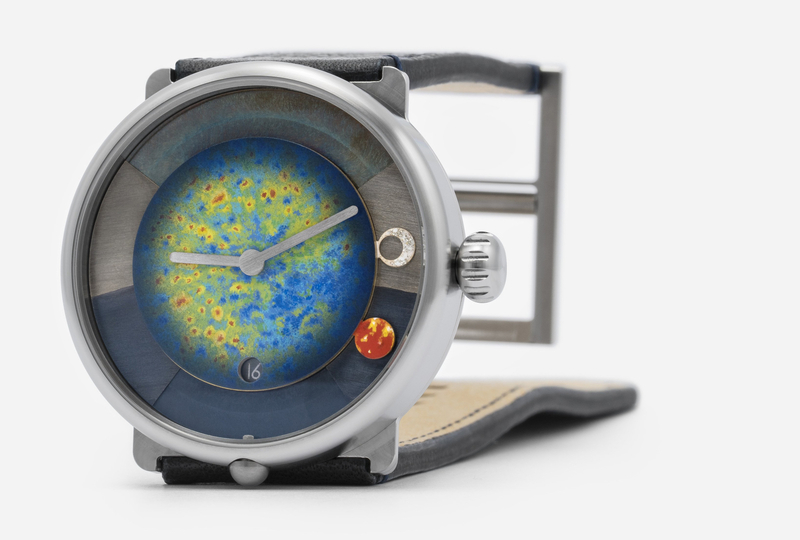 After glass-bead blasting the white gold dial, he heats it in an enameling oven to induce the distinctive patination. The calendar adjusts to the length of each month automatically, with the exception of the change between February and March, which must be set manually. 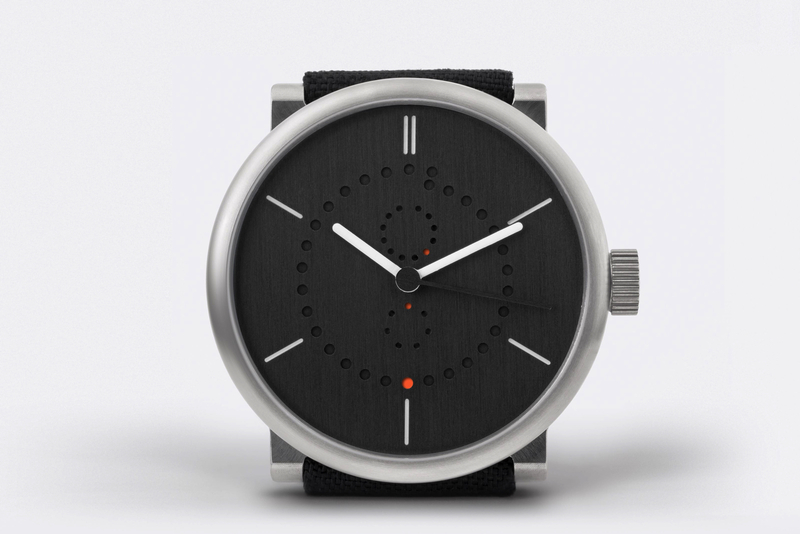 The 7-aperture weekday display shows two dots between 6 p.m. and 6 a.m. to indicate the promise of a new day. It’s up to the owner to decide whether the topmost aperture should indicate Sunday or Monday. The Anno Cinquanta is powered by Paul Gerber’s proprietary self-winding caliber and features a heat-patinated white gold rotor. The hand-built self-winding caliber is 36 mm in diameter and is finely adjusted by an eccentric screw-type micrometric regulator newly designed by Paul. Power reserve is impressive at over 100-hours. The strap features an unpolished pin buckle and is hand-stitched in ecologically tanned cowhide sourced from Ecopell in Germany’s Allgäu region. The Ochs und Junior logo is applied to the lining of the ecological leather strap with a branding iron. The Anno Cinquanta is presented in a soft Ecopell leather wallet. The Cinquanta’s simplistic circular aperture based annual calendar display, distinctively patinated dial and rotor, exclusively designed movement and expert hand finishing result in a superb timepiece. The price is $42,200 – $50,250.